This was my first songwriting retreat. I had come with an open mind and heart to see what I might learn and develop with my own songwriting. After preliminary introductions with other writers, prayers of request for Holy Spirit guidance, we broke out into free writing time. I had brought along a few unfinished songs and melodies to give myself some kind of starting point. Immediately I noticed this wasn’t the right time for their development. I began talking and sharing with another writer about ideas of music. She had some lyrics with no music. With my guitar we began to put chords and verses together. In an hour the song was finished. This was the first time I had ever done collaborative writing. The group shared their songs for feedback as did we. The music was well received with encouragement. The morning fellowship consisted breaking bread with other retreat attendees. It was during this time I learned the different ways people write, the way they view their gifts or talents, and the musical/spiritual journey they’ve been on. Breakfast was followed by Church Service in the sanctuary (again seeking God’s blessing and guidance for the day). Today’s work time was spent by myself finishing a song that began a few years ago. It was started at a time when I was diagnosed with cancer (and eventually healed). The ideas were about facing the unknown and having to hold on to the faith of believing in God’s healing power. Today the song was finished. It was the right time. 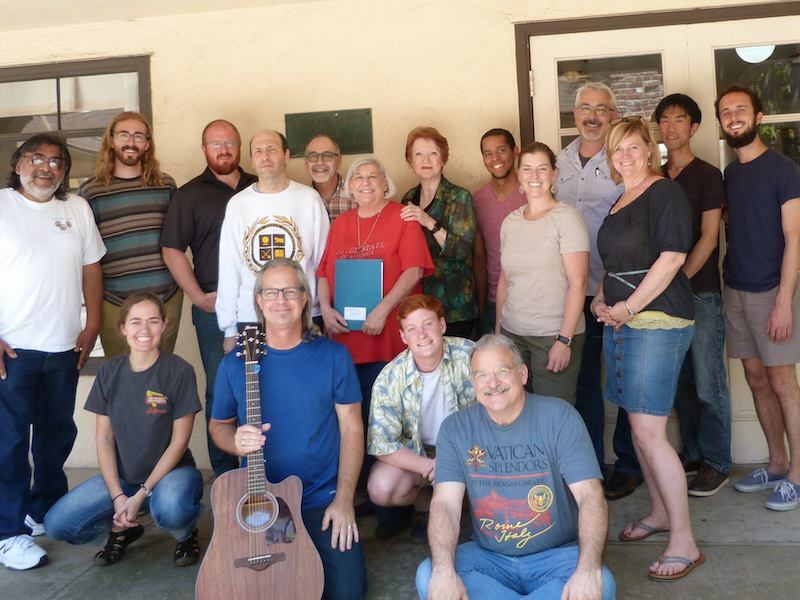 The end of the day was spent together in the sanctuary, with everyone sharing their finished songs. I don’t believe in “coincidences.” This was more than a songwriting retreat, I was meant to be here. As songs were shared, the Holy Spirit stirred within me. I felt His presence in the voices, words, instruments, chord changes, strings and tonewoods. I had been doing personal caregiving for 4 years. Endless hospital visits, medical procedures, ICU, surgeries, doctor visits, prescription deliveries, housecleaning, groceries, cooking, etc. etc. It had taken a tremendous toll on my physical, mental, emotional, and spiritual health. It all presented itself to me in those moments of song sharing. Arend, the retreat facilitator, noticed and asked the group for prayers on my behalf.